This is a short 5 minute feature produced for radio. The subject was the 'Old Croghan Bog Man' a bog body which was found in 2003 in Co.Offaly. Packages like this one can be produced by Vivify for promotion of information packs on almost any subject. A full audio editing service is also available. One of my Daughters favourite books growing up was "The Gruffalo" so I thought why not produce an audio recording Of the book so she could listen to it when she wanted. I really enjoyed producing this one. As part of an Audio Drama project last year we came up with a pilot for a series of short comedy sketches for radio. Rusty & Jane are 2 year old toddlers that meet every morning when they are dropped off at Sunnyside, a creche just outside Dublin. Each morning they are placed together at a small table. As soon as the grownups have left them alone, they converse about their day so far and what has been happening in their hectic toddler life. The App is a available for download on both Apple & Android devices. The app allows the user to walk in the footsteps of the men and women that took part in the fighting during the 1916 Easter Rising in Dublin. 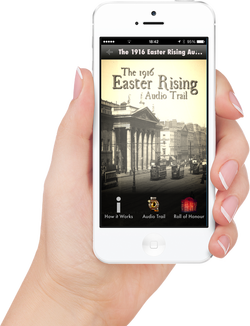 The app's GPS mapping system will guide you through Dublin's streets, stopping at 16 significant Easter Rising locations. You will then be able to listen to a full and detailed audio description of what happened at that particular building during the Easter week of 1916. Keep an eye on our blog and social networks for more info in the coming weeks.